Saturday 1st September marked the annual #BacktoHogwarts celebration, where hundreds of Wizarding World fans from across the nation journeyed to King's Cross to join in on the infamous Platform 9 ¾ countdown. However, for a number of fans this was a magical experience like no other. 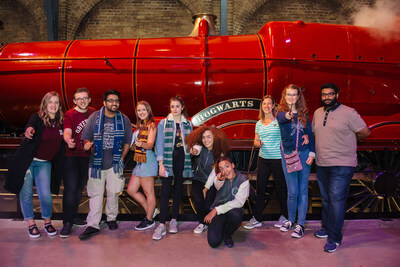 A selection of Wizarding World fans from across the UK who have always dreamed of going #BacktoHogwarts journeyed down to London in their very own Knight Bus, inspired by the mode of transport from Harry Potter and the Prisoner of Azkaban as part of a magical trip. 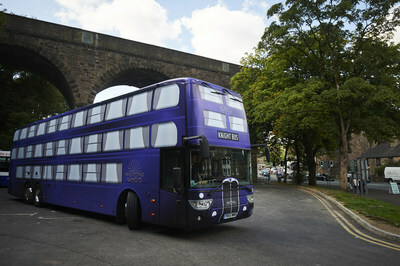 Starting off in Manchester, the Knight Bus fan experience toured around the country, picking up superfans along the way to transport them directly to Platform 9 ¾ in time to witness the countdown. 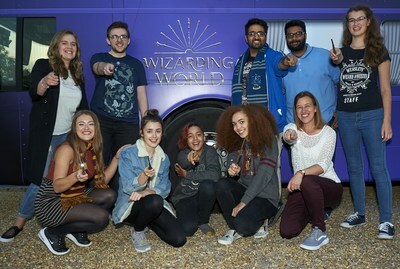 The magical-inspired Knight Bus was decked out with special Wizarding World surprises for the fans, from deluxe beds covered in Harry Potter bedsheets and a screening of Fantastic Beasts and Where to Find Them, to delicious feast-worthy snacks. Once the Knight Bus arrived at its King's Cross destination, the fans were able to join hundreds of fans for the 11am countdown to the Hogwarts Express' departure and were surprised by some very special stars of the Wizarding World: Eddie Redmayne and Jude Law. Finally, to complete the Wizarding World experience and add a final bit of magic, the fans were taken on a spellbinding tour around Warner Bros. Studio Tour London - The Making of Harry Potter.